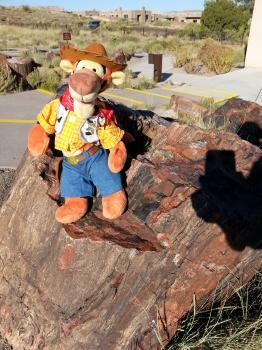 Agate Bridge in the Petrified Forest National Park, Arizona: History preserved but not forever, see it while you can! Tigger Travels - Family Adventure Journal Photos From Tigger`s Travels and MORE! Agate Bridge seen with the 1917 concrete support. 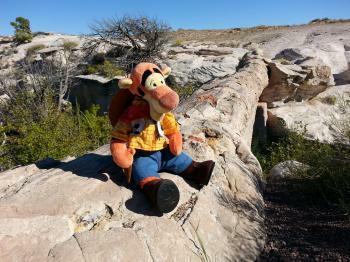 Tigger Contemplates the millennia represented by this one sight! 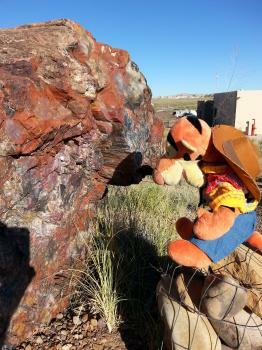 Other sights offer views of impressive pieces of petrified wood. History preserved but not forever, see it while you can! In the eastern end of Interstate 40 through Arizona at exit #311 is the entrance to the Painted Desert Inn and Petrified Forest National Park. There is a single road that passes through the whole area that is worth a leisure drive to see the sites. 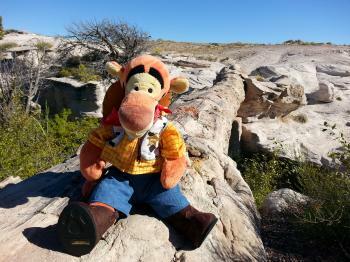 There are dozens of places to stop and get out to look at scenery and historic sights of various importance. One of the stops is the Agate Bridge, which at first glance may seem unimpressive until you see it with the history it represents. The very first thing to keep in mind here is that when it is gone, it will no longer be seen here! With the current philosophy of the National Park Service, no more efforts will be made to prevent the progression of nature on this site. In 1906, the sight was declared a National Monument and five years later masonry pillars were installed to preserve this single piece of Agate that has been left standing as a bridge over the arroyo (gully). At 110 feet long (about 34 meters) this bridge resisted erosion for centuries! 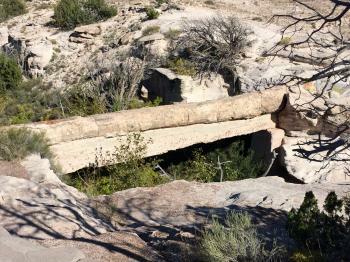 There is now a single span of concrete that holds the log in place that was installed in 1917, a century ago, to extend the life of this unusual situation. If it were discovered today, this Agate Bridge would be left in its natural state and allowed to eventually fall allowing nature to take the natural course of evolution. We do not know how much longer it will be standing so, if you are in the area, take a couple hours, take one of the most scenic drives and stop at all the scenic overlooks and historical points of interest along the way. Get a picture with the Agate Bridge because some day our descendant will no longer be able to see this peculiar site ever again! Think of all the conditions that had to come together at the right time for this to happen... For Tigger, this is simply an amazing thing to see! When it is gone, it will only be a memory for those who were there.